The last German offensive of World War II began at 5:30 a.m. on December 16, 1944. The rank-and-file German soldier thought he was giving Paris back to the Führer for a “Christmas present.” The more experienced Wehrmacht commanders knew that, even should they reach the Meuse or—more fantastically—capture Antwerp, they were fighting but to delay Allied victory. Caught off-guard much as Germans had been at Normandy, the Allies were the victims of a massive intelligence failure and a degree of holiday-season complacency. They had failed to notice the buildup of 400 thousand enemy infantry, 1200 tanks, and over 4 thousand artillery pieces. Many men and senior officers were on Christmas leave. The 101st Airborne Division, the Screaming Eagles, to whom the pivotal defense of Bastogne was shortly to fall, were scheduled for leave in Paris and both their commanding officer and their deputy commander had already left. Thus the 101st were led into their greatest fight by the division artillery commander, General Anthony C. McAuliffe. When Bastogne was surrounded and the American field hospital captured, when our artillery was down to ten rounds per gun per day and one in four men had been wounded or killed, General McAuliffe had the honor of rejecting the German surrender demand with a single word: “Nuts.” This colloquialism had to be explained to the Germans and has thrilled military historians, filmmakers, and fighting Americans ever since. But not everything was nearly so inspiring, particularly in the early days of the offensive, which discovered serious flaws in the Allied command: Bradley was caught completely by surprise with his headquarters in the wrong place. The stubborn and chronically unimaginative General Hodges, who had already ground down his First Army in the previous months’ fighting in the Hürtgen Forrest, was again unable to adapt to a changing situation. But the worst offender was the famous British field marshal Montgomery, despised by every commander with whom he came into contact and whose personality was so corrosive that Antony Beevor speculates he might have suffered from “what today would be called high-functioning Asperger syndrome.” Montgomery spent most of the offensive jockeying for overall command of the Allied ground forces—a task to which he was unsuited both militarily and politically. Thanks to Montgomery, the American military victory in the Ardennes was also a British political defeat and the end of serious British influence in the conduct of the ground war. Anthony Beevor’s book is a generally excellent balance between localized anecdotes and the more broadly historical account which they flavor. The research is meticulous and the pacing is excellent. In the event, the dramatic German defeat in the Ardennes crushed the German army to a degree that left it totally unprepared to fend off Russia’s Vistula-Oder offensive in January. The German command had failed to consider the terrible road conditions which bogged down their tanks and were unaccountably stingy with fuel and strategic reserves. But, principally, they had underestimated the speed with which Eisenhower would react, and the tenacity, skill and courage with which the American soldier would fight. 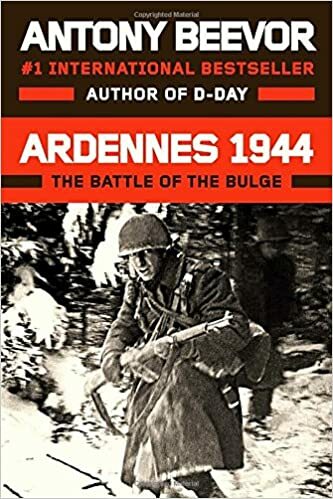 Ardennes 1944: The Battle of the Bulge, by Antony Beevor. Viking Press, 2015. 480 pages.